Even though I'm now spending most of my work time in the garden, the output is only barely increasing over winter production levels. We're swimming in lettuce and leafy greens, of course, but the freezer is nearly empty so I'm glad to have some new additions to round out our meals. One of my favorites is kale raab. I tried to grow broccoli raab one year, but was disappointed by the flavor and by how quickly the plants went to seed. 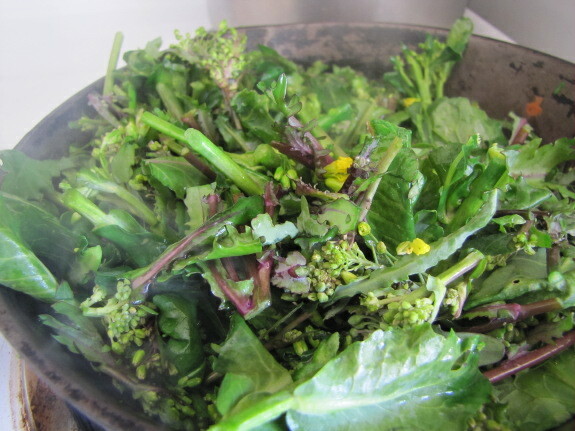 The blogosphere (can't remember exactly who) taught me a couple of years ago that you can eat the flower buds of any of our edible crucifers just like broccoli raab, so now I don't plant anything special, yet still enjoy the spring treat. Kale raab is our favorite this year, brussels sprout raab wasn't bad, but oilseed radish raab was a bit bitter and probably isn't worth repeating. (Our other crucifers don't survive the winter, so no raab there.) All raabs can be sauteed, but are even tastier roasted with a light coating of olive oil, salt, and pepper. Now's also the time to enjoy perennial vegetables. We've only had one mini-meal of asparagus so far, but are looking forward to more sweet spears. 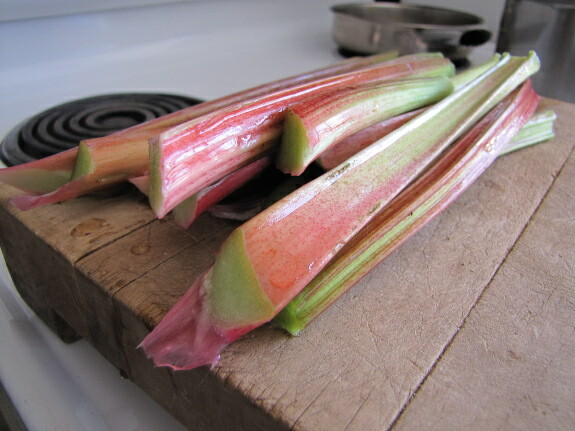 In the meantime, I harvested rhubarb (even though Mark won't eat it) and roasted some up with sugar, orange peel, and a hint of cinnamon --- delicious with yogurt! Although many of you might think it sounds spartan to eat so few types of vegetables in the early spring, we vastly prefer a limited menu of high-quality food to the out-of-season contents of the grocery store. We do splurge on avocados, though, because I'm addicted and we can't grow them here. Our chicken waterer provides refreshing drinks of clean water between foraging expeditions. This post reminded me that I've meant to ask this. I've been reading (and loving) your blog (and books) since Mark was on TSP and I'm super curious to know, how much of your food do you two produce yourselves? As a hopeful homesteader, I'm trying to get an idea of how long it takes to build up the production level to actually produce a large amount of your own food. I read the Nearing's book "A Good Life" and they said that they were producing about 85% of what they ate (which seemed to include a LOT of turnips...). Marjory Wildcraft suggested that it would take around 4 or 5 years to get some serious garden production. What's your experience like? Stephen --- We grow 95% of our own vegetables, maybe 10% of our own fruit (with much more to come in the next few years as fruit trees come into production), and 30% of our own meat (with hopefully more to come as we get extra pastures going). We still buy sugar, peanut butter, flour, spices, chocolate, lots of fruit, meat (as much as possible from a friend who raises animals on pasture), dairy products, pet food, and other odds and ends. The answer to your question about time is a bit tricky because it depends on what you're starting out with and what your diet is like. 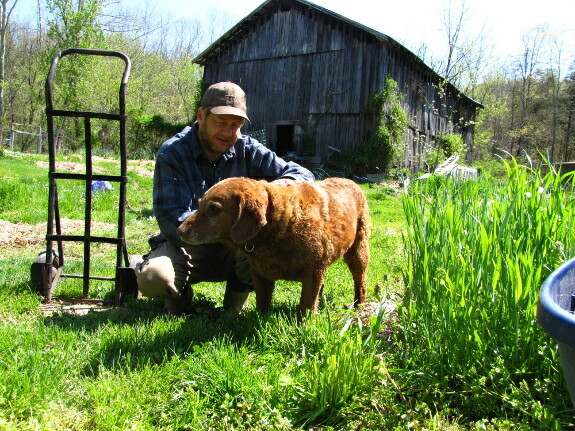 If you have an existing pasture, then red meat and dairy is easy; if you have a garden spot, then vegetables are easy. In either case, of course, you'll probably want to start small as you're learning, but could be growing nearly all of your food of that type in 3 or 4 years. On the other hand, if you're reclaiming land from forest (or city), it's going to take a lot longer to get there, and any project can take an extra 2 to 4 years longer than you'd think as you learn the land and your own climate. Fruit takes a long time. You can get strawberries, blackberries, and raspberries pretty quickly, but those are high-work crops, so you're unlikely to want to grow enough to feed you all your fruit needs. (Especially not if you're frugivorous like us.) And things like apples can take up to 10 years to produce, plus a couple of years of learning curve ahead of that. We don't eat many carbs other than fruit, and grow nearly all of them in the form of roots, butternut squash, etc. If you're a grain person, it's tougher to grow your own there since harvesting grains without machinery is time-consuming, but if you're willing to change your diet over to sweet potatoes and other easy crops, you can reach carb self-sufficiency in a couple of years. Our goal is to get our fruit production up to the same percent as our vegetable production, and to either increase our meat production or find more local sources of pastured meat and dairy. I'm okay with still buying things like sugar, flour, etc., in the store since we don't use much of them, but I'd like the things that make up the largest quantity of our diet to come from quality sources. How awesome to be that self sufficient in your food production! Reading your answer above made me realize that i dont recall your ever talking about growing many beans or other legumes... Being primarily plant based eaters, we eat ALOT of beans. Is that not something you grow at all? I will plant some in my newly expanded garden area this year, but the soil isnt really great yet, ( was almost non existant to start with) so i dont expect much of a crop, but hopefully a little nitrogen fixing at least. Being in an area where the traditional native american crops are the " three sisters" - corn, beans, and squash- i set aside one block of garden to grow these things together as the native peoples did, in a sort of experiment. The ancient ways were very in tune with the natural order. The tradition is to plant the corn in a block, then the beans around the corn, using the stalks as support, and then the squash, which were more like pumpkin, around all of it, each plant provides help to the others. Beans fix nitrogen,, corn provides a trellis, and the spikey leaves of the squash discourage raccoons from getting at the beans and corn because they do not like to step on them. Will be interesting to test this. Deb --- We grow green beans and sprouting beans, but I consider them in the vegetable group rather than the protein group. Mark really doesn't like dried beans, so I only slide a few into our diets. We tried growing dried beans a few times, but they turn out to be as laborious as grains to process, so it didn't seem worth it. We also tried a three sisters planting with very little luck once, but I suspect the main problem there was that I didn't yet know that the back garden has terrible soil that can't handle tilling. On the other hand, I've since read that three sisters really only works well with field corn, and we like the less vigorous sweet corn. To follow up on your answer, I had another question. I saw in some other post that you and Mark each spend 3 hours 5 days a week doing farm stuff. Does that include anything related to the farm (weeding, chicken feeding, harvesting, etc.) or is it specifically on "projects" that are in the works, and the other daily activities are just chalked up to the "chore" portion of the day? Currently, I'm renting in Detroit, but I'm taking some first steps to hone my homestead related aptitudes (with a small urban garden plot, homebrewing, and reading a ton of books on the subject) with the hope of in a couple of years getting out to some more rural place here in Michigan. I'm just wondering because I work from home (copy editing) and only need the internet to have an income, and I'm trying to think through some of the process of how much I'd need to work, estimating expenses, etc. for when I finally get to live on a homestead full time, so to speak. For now, I'm trying to find contentment in not being over my head, but I like to do a little dreaming now and then. Stephen --- The things we don't count into that work period, but which others might, include basic animal care (feeding the cats, dog, and chickens, taking in the eggs, and walking Lucy) and cooking (although cooking does count when it turns into preserving --- fine line there). Weeding and other garden upkeep is definitely a working-hours task, and Mark's pretty strict about keeping my workaholic tendencies in check. Good luck with your homestead! It sounds like you're on the right track, planning ahead and not getting in too much over your head right away.